I clearly need to start spending more time on Stockton Boulevard. Places like Boon Boon Cafe, Anna's Vegan Cafe, and Huong Sen Tofu, an Asian vegetarian takeaway shop, make this section of South Sacramento a vegan paradise. And now there's Vampire Penguin, a shaved snow restaurant that opened last fall. I stopped in Friday afternoon to give it a try. The menu displayed behind the counter has four columns. 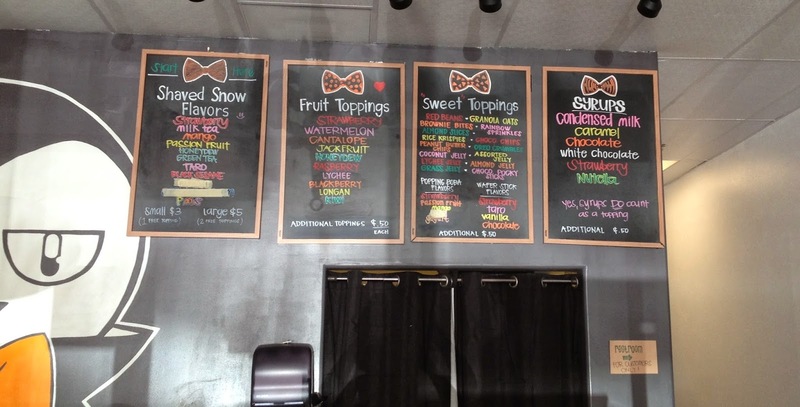 The first column lists the shaved snow flavors, all of which are vegan. The next column lists the fruit topping options, which, of course, are vegan too. The third column lists other topping options, which may or may not be vegan -- you'll have to ask. And the last column lists the syrup options. Only one of these, strawberry, is vegan. I asked the woman behind the counter which shaved snow flavor she liked the best, and she said her current favorite is PMS, a mixture of peach, mango, and strawberry. I ordered that, along with strawberry syrup and strawberries. I don't know about you, but the snow cones I had when I was a child were messy and crunchy, and they lost their appeal when I grew up. I was happy to discover that Vampire Penguin's shaved snow bore absolutely no resemblance to the snow cones of my childhood. This was a delicious dessert, with a consistency more like ice cream than snow cone. 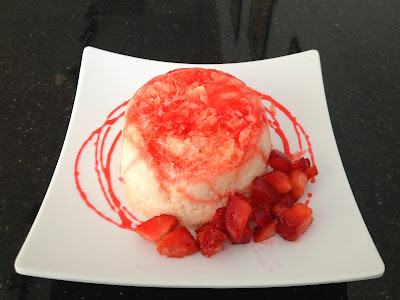 I loved the flavor of the peach, mango, and strawberry shaved snow, and the strawberry syrup and chopped strawberries gave it a little something extra. I went back on Saturday with my husband, who tried the same shaved snow combination I had on Friday. He really liked it too. 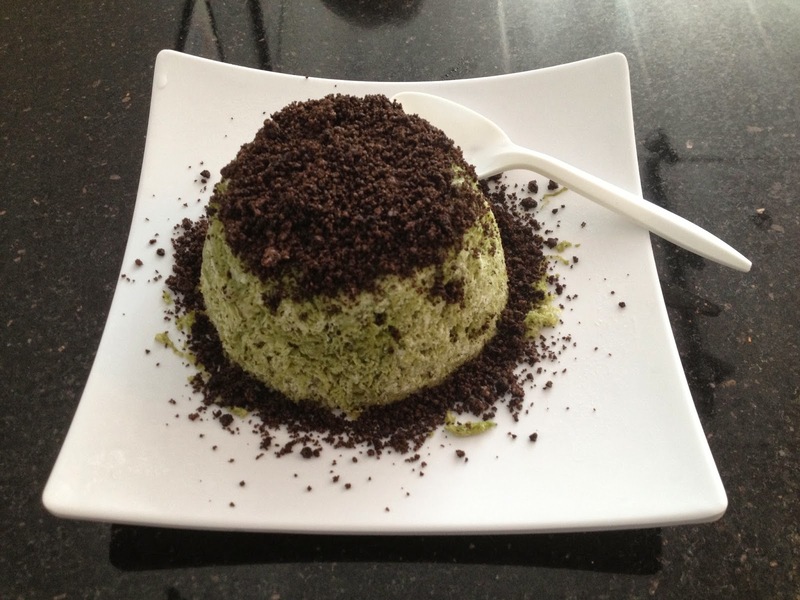 I decided to try one of the non-fruit flavors, green tea, and for my topping, I chose Oreo crumbles. They may not be particularly healthy, but at least they don't contain any animal products, and they were the perfect garnish for the green tea shaved snow. After two visits in two days, I can already tell that I'm going to be spending many happy afternoons at Vampire Penguin! Vampire Penguin is located at 6821 Stockton Boulevard, #110. They don't appear to have a telephone number or a website, but their Facebook page can be found at https://www.facebook.com/VampirePenguin916. The restaurant is open Sunday through Thursday from noon to 8:00 p.m., and Friday and Saturday from noon to 10:00 p.m.
we went there a few weeks ago and it was so good! i split the tuxedo (i think) with my husband. he's an omni and it had condensed milk. oh the sacrifices we make..
Next time, see if your husband will split the PMS with strawberries with you, Elaine. It's vegan, but my non-vegan husband loved it. Hey - so I'm not sure this place actually has vegan options. I gave it a try a couple weeks ago and it was so creamy that it made me uncomfortable so I emailed them to get the ingredients. Non-dairy creamer is used and it has some ingredients that may or may not be vegan. They didn't realize that non-dairy didn't necessarily mean vegan. It is just dairy free. Could be vegan as the non dairy creamer they use is Mocha Mix but I can't seem to find any info on the web. Did you do any research? The reason I went there in the first place was because their Facebook page said their shaved snow was vegan, and the cashier confirmed that for me when I ordered. I'm going to be heartbroken if it turns out not to be vegan because they didn't know what vegan meant, Kathryn! I'll see if I can find out anything else. Thanks for bringing this to my attention! We went to the one on Laguna yesterday not really knowing what this was. We were thinking "snow" as in really finely crushed or shaved ice and were surprised at how creamy the ice was. I wondered what it was made of, and didn't ask when we were there because the place was kind of loud and I didn't want to seem fussy or as if I was giving the staff a hard time. Plus, I hate that blank stare a person gives when the word, 'vegan' is tossed around and he/she doesn't know what it means, especially when it's paired with that long, "Uhhhhhhhhhhh," as if I'm no longer speaking English. When we got home, I called them and they said the snow is "vegan friendly," so I asked what that means to THEM. Someone's grandma might think chicken broth to make vegetable soup is vegan friendly, you know, so clarification was necessary. The guy said the ice is made from flavorings, water, and a nondairy creamer. I asked if it was Coffee Mate or something like that, or if it was an actual vegan creamer, and he said he didn't know because they didn't make it on site. The blocks of snow come to them already prepared and they just shave them and add toppings. So, eat Vampire Penguin at your own risk. They say it's "vegan friendly". I can say that when consuming dairy, the entire next day I cannot be too far from a bathroom if you catch my drift, and today I've had no intestinal upset thus far. So, I don't think the snow is actually VEGAN, but if a vegan is fine functioning more in line with strict vegetarianism and is OK with taking a chance on a nonvegan, nondairy creamer, then Vampire Penguin will be a nice treat. The dessert I had was just simple mango ice with fresh strawberries and it was delicious. it tasted like a strawberry shortcake. Maybe someone with a better understanding of those chemicals can tell us whether the ingredients are all vegan or not. Thanks for the reminder to always be on the lookout for hidden non-vegan ingredients, Avi!